Amy is on staff at Woodridge Church as the administrator. She has been playing piano for over 18 years and has been teaching private lessons for over 10 years. She studied Music and Piano Performance under Richard Perkins and Joyce Jensen at Anoka Ramsey Community College for two years. 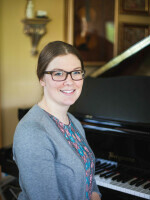 As an experienced piano teacher, Amy brings to her students a variety of styles and techniques. She loves to be creative and design the lesson to suit each students needs while teaching them to be proficient in sight reading, technique and strength, and theory. Amy also loves to do photography and is married to her husband, Jordan, and has a daughter, Leora. 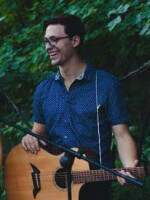 Austin works at Woodridge Church in Student Ministries. He has the privilege of being the worship leader for Student Ministries and the Student Band leader. He has been playing guitar for 8 years and has gained much of his experience by playing with local musicians and leading worship in various churches and Bible Camps throughout the Midwest. Austin offers both electric and acoustic guitar lessons. He has a deep passion to see students and adults grow and flourish in the arts and their freedom to express themselves through music. For this reason, lessons with Austin are always uniquely shaped by student’s interests and goals in music. Lessons with Austin are defined by an environment of encouragement so that his guitar students feel equipped for growth and inspired to achieve.